Hey Alyssa! I hope you're doing fab! I’ve noticed how positive your posts are and you really have a lot of inspiring content! I wanted to reach out and see if I could interview you for my show about empowering women. Think you'd be so awesome. Could we set up a time to discuss more?! Let me know. Thanks, girl! 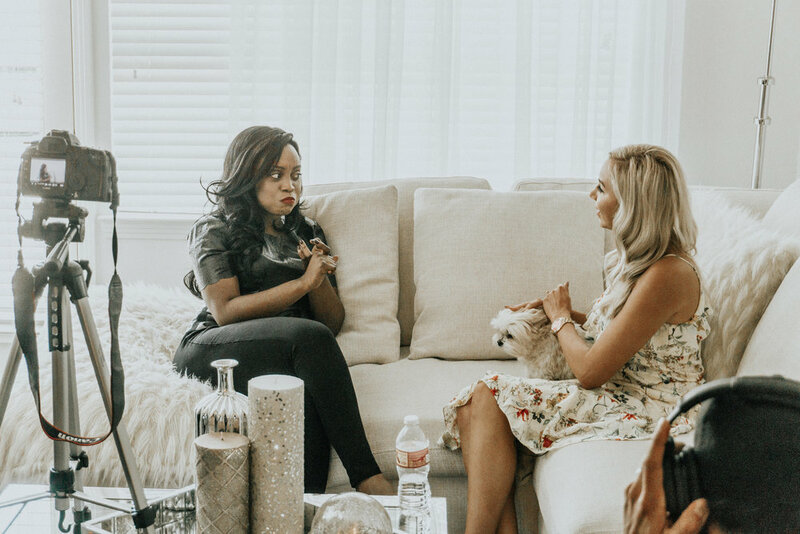 I absolutely adored Vivian’s energy and am all about empowering women through stories and experiences. We set up a call and chatted for almost an hour! We caught up and discussed everything from her impressive show, Vision in Vogue, to her current job as a news anchor on ABC as well as having her on The Freddie & Alyssa Show! It was a perfect fit right from the start. September 30th arrived before we knew it and at 11 am the crew came to set up for the afternoon of filming. After Benji settled down a bit, (he is so extra - he loves claiming his territory when new people enter our home) Vivian and I got mic’d, and we cozied into the couch, ready to shoot! Our little prima donna, stealing the show, per usual. We jumped right into the interview and discussed a variety of different topics. Vivian was especially interested in stories regarding my recovery and journey back to health after a car accident that took place almost four years ago (October 7th, to be exact!) We also spoke about our upcoming book, The Pivot Principle, which is all about pivoting your mindset and your actions so that you can pivot your life. We filmed for about an hour and a half and then wrapped the interview portion. This week, we will be shooting the photo shoot segment (hence the Vision in Vogue) where I shall get all dolled up for the day and play at the photo shoot! Re-connecting with Vivian is such a perfect example of life coming full circle. We had met years ago on the telephone while collaborating on a project. While we continued on our separate paths, she booked a job in Chicago as a news anchor, and we continued our entrepreneurial endeavors and launched the vlog, blog, and podcast. It wasn’t until years later that we re-connected, finally met physically in person and created some heartfelt and meaningful content that will hopefully help others realize they are not alone when going through hard times. I guess my ramble is just a reminder that you never know where life can lead you. Enjoy every moment. Scream from the peaks, laugh through the loop-the-loops and enjoy every twist and turn, as you never know what magnificent surprises you may find on the other side!